The PPMA Group Industry Awards returned to the National Motorcycle Museum for 2017, rewarding a range of businesses and individuals for their achievements throughout the last 12 months. Over 400 industry leaders came together for the gala dinner, which was hosted during the PPMA Show – the UK’s largest processing and packaging industry exhibition. 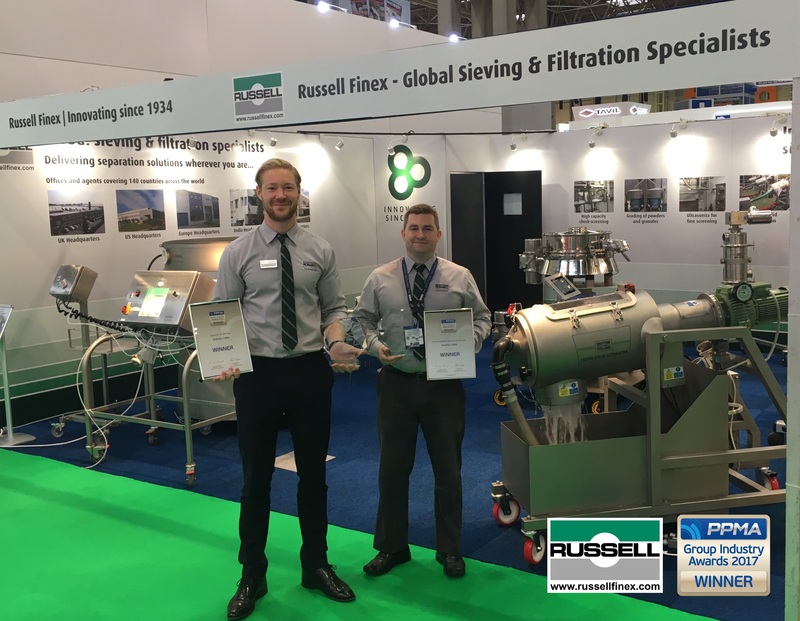 Russell Finex was delighted to receive two awards at this year’s ceremony, highlighting another successful year for the company. The annual PPMA Group Industry Awards recognise nine categories of achievement, showcasing a range of talent and innovation in British manufacturing. Following recent success at the PPMA Group Industry Awards 2016, Russell Finex once again took two awards this year, winning Exporter of the Year and Environmental Initiative of the Year. Having won the Exporter of the Year in 2016, retaining the award highlights the success of Russell Finex as the company continues to expand its overseas business. Global leader in the manufacture of industrial separation equipment, the company has been established for over 80 years, with over 70 years involved in exporting products to overseas markets. This business is channelled through the UK subsidiary as well as four overseas sales subsidiaries located in the USA, Belgium, India and a new subsidiary in China. An exciting development in the last 12 months has been the opening of a new subsidiary in Shanghai, China. Being the world’s second largest economy, it is extremely important to hold a strong representation in the country, and provide customers with local stockholding, meshing services and a test facility. Other recent developments also include the opening of a local sales office in São Paulo, Brazil, and the addition of further foreign language websites, and Russell Finex will continue to advance its overseas sales and marketing strategies to ensure its global customer base has the best access to the range of products and services. The Environmental Initiative of the Year Award was introduced for the first time at this year’s ceremony. Winning this category is a reward for the substantial changes that have been put in place by Russell Finex, as the company strives to become more energy efficient and lower its carbon footprint, without affecting growth. The streamlining and expansion of Russell Finex’s UK manufacturing facility has played a key role in more efficient performance. One example of this saw Russell Finex make a push to go paperless through certain factory processes. This project was completed inside three months, eliminating the use of administrative paperwork whilst improving factory performance, with the introduction of new software and smart working practices. This project is part of a wider culture of continuous improvement, which considers all the company’s processes periodically to ensure that they can cope with continued growth and increasing capacity, with minimal effect on the environment. The adoption of environmentally responsible energy resources has played a key role in this. Russell Finex has made a conscious effort to address its carbon footprint with the installation of solar panels across the entire roof of its manufacturing plant. The company also recently installed a wood pellet boiler, powered by biomass, to heat various areas of the production facility. Also, eco-certified air conditioning systems and LED lights were installed throughout the entire building. The company reuses and recycles much of its commercial waste, including industrial materials. Last year saw 12 tonnes of paper, 7 tonnes of cardboard, 48 tonnes of waste metal and 36 tonnes of wood reused or recycled, further reducing the company’s landfill, and electronic equipment is also collected and recycled as required. Aside from these in-house changes, Russell Finex has also made a conscious effort to support environmental, recycling and water treatment industries with its range of machinery. 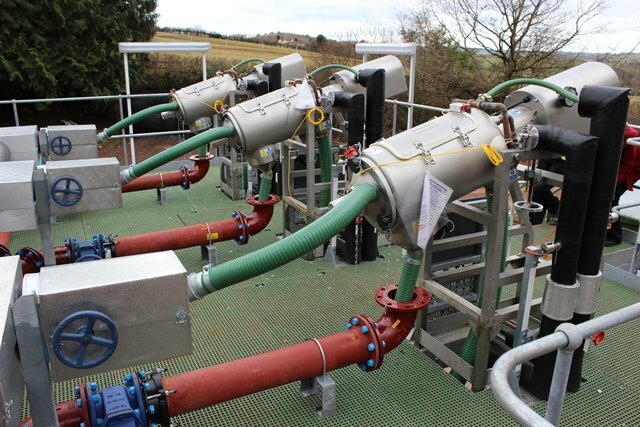 A variety of separation equipment can be applied to the sorting of recycled materials such as glass, plastics, metals and paper pulp, as well as treating water and effluent, plus organic waste used for bioenergy resources. Russell Finex would like to thank PPMA Group, as well as Sutton Winson Ltd for selecting the company for these two awards, and congratulates all other successful companies. To find out more about Russell Finex and its range of equipment, contact us today.